Elvis is back in the building, sort of. Authentic Brands Group, which manages Elvis’ estate, and digital production company Pulse Evolution will bring the King back to life as a hologram. 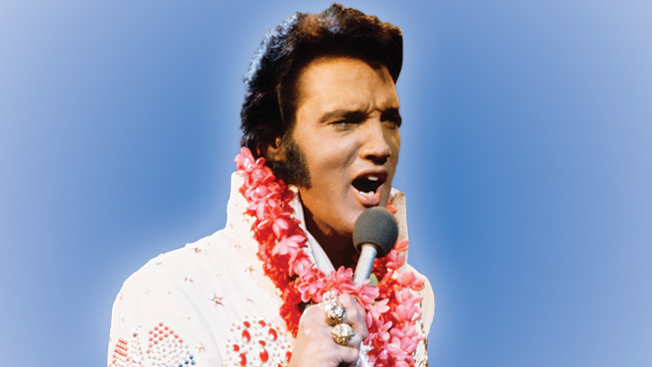 The companies plan to have Elvis shake, rattle and roll in live shows, commercials and movies. Since digital Elvis will involve 11,500 moving parts, Authentic Brands Group CEO Jamie Salter said he won’t be available for projects until spring 2015 or live performances until fall 2015. But, Salter hinted that the King has a commercial deal with a Fortune 500 company. He’s also is in talks for four-night-a-week residencies in Las Vegas and Macau, and may even do special performances with a hologram Michael Jackson in the later location. “We want you to go to the show and say, ‘Wow, oh my God! I saw Elvis 50, 60 years ago, and this is exactly the same thing,’” Salter said. Any hologram deals will have to go through the family’s final approval before being inked, but both Pricilla and Lisa Marie are completely behind using the technology, according to Salter. They’ve supported posthumous performances in the past, including when Lisa Marie sang a duet of Daddy Don’t Cry with Elvis in 1997 that used the original vocals and a video featuring her and her father. Consultant David Deal said performances generate the most money for musicians today, and a hologram in the repertoire may significantly increase revenue for the deceased. It’s the perfect way to capture the stage charisma these artists were known for and to connect with a visual generation. “I think the only thing that needs to be in place is that the names have to be strong brands with a strong global following,” he said. Gartner’s Andrew Frank added there’s tons of money in celebrity endorsements, considering that advertising budgets are on the rise. As the hologram technology gets better, he expects that we’ll see these digital counterparts directly interacting with people, including having them sing a personalized song or talk to a consumer on behalf of a brand. The technology may even open doors for the living, argued Forrester senior analyst Anthony Mullen. Artists could virtually perform in multiple places simultaneously, solving a distribution problem similar to how MP3s have spread music faster than CDs and vinyl records. Then again, musicians may want to read their contracts more carefully, he pointed out. This could mean the music industry may begin to negotiate for after-death digital image ownership while the artist is still breathing. “People talk about musicians selling their souls to the devil when they sign a deal with the record label. This could be a posthumous issue if today’s musicians agree to it,” Mullen said. Mullen is also concerned that these singer spokespeople will be made to talk about products they never tried or endorse politicians they never would have voted for, while Frank is worried about fans accepting posthumous declarations of support. “We’re pushing the envelope for how much synthetic personality people are willing to go for,” Frank admitted.